Iran-Mahshahr, 12 November 2012. 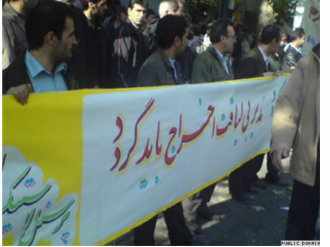 The Islamic regime’s news site ILNA reported that 300 workers of Fajr Petrochemicals have been on strike since yesterday. The protests of workers at this factory against the failure to pay the May 1st bonus, the unfulfilled promise of an increase in wages made by the former contracting company RAMPCO, and workplace safety issues led to a total strike since yesterday, Saturday 11 November. Fajr workers have complained about the lack of safety tools and measures throughout the entire factory. The delayed May 1st bonus is 100,000 touman per employee, and Fajr is the only petrochemical factory in Mahshar that has not paid this bonus.